I discussed the 8 Reasons Salt Soaps are Fabulous for the Skin. If you need some motivation to give these fun bars a try, then check that out. Today, I want to cover How to Make Natural Salt Soap Bars. 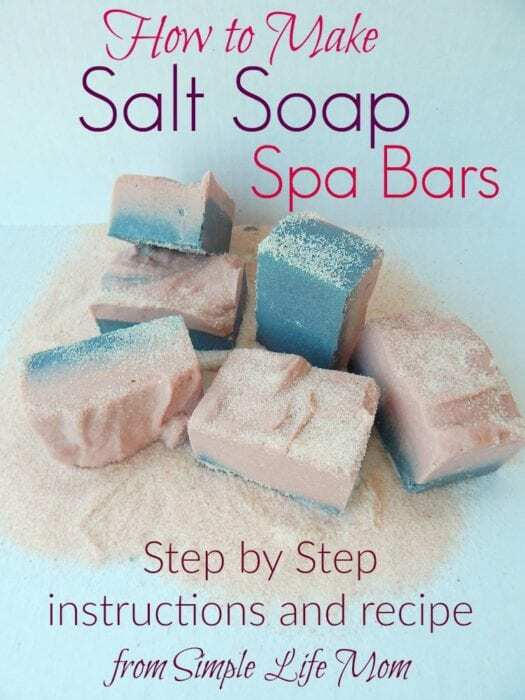 If you are a soap maker, but have never tried salt soaps, then you need to understand that there are some differences that you need to make to your recipe and procedure, depending on what type of mold you are using. Even if you’ve never made soap before then you CAN do this. I usually recommend that people make a basic soap recipe first, but there is no reason why you cannot make this type. I always say, making soap is like baking a cake. Just follow instructions carefully and measure carefully and you’ll do great. Even if you do make mistakes, hot processing always saves the day! Start with my 7 Easy Steps to Homemade Lye Soap for Beginners. 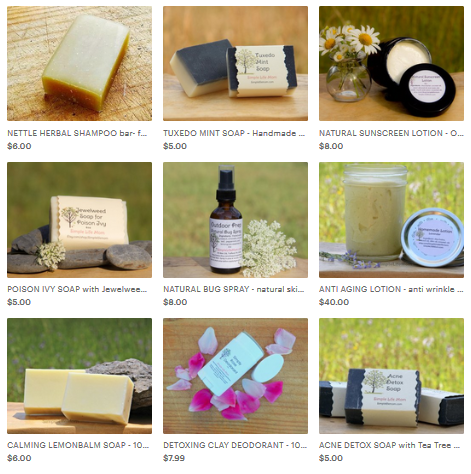 When you design a soap recipe, it’s good to think of your ingredients in categories of oils, lye water, and other additives (essential oils, salts, honey, etc.). You also need to consider what superfatting percentage you will use. This is the amount of oils that will be left over after all the lye is used up (also called lye discounting). getting rid of the tallow all together. Normal soap bars are superfatted. When lye molecules pair with oil molecules to make soap, more than enough oil is added so that some oil is left over. This is lye discounting (there’s not enough lye to cover all the oils present). A typical body bar is 5% lye discounted. Due to the salt and coconut content of a salt bar you will want to raise the superfat percentage to 15-20%. I prefer 20%. It’s what I’ve had great success with and so it’s what I stick to, but others swear by less (and sometimes more). Either way, it needs to be higher than you use for normal body bars. The salt amount used is compared to the amount of oils in ounces. For example, if you are using 35oz of oil in your recipe, then a 1:1 ratio or 100% ratio would be adding 35oz of salt. The amount of salt can vary depending on your preference. A 50% ratio (e.g. 32oz oil, 16oz salt) will give you a nicely salted soap that is more akin to traditional soaps. While a higher salt ratio will give you a harder and grittier bar of soap (super fun!). I think, if you’re going to make a salt soap, go all the way. 85-100% makes a great salt bar. There are certain ingredients that can cause a soap to sweat. In general, a high mineral content like that in dead sea salt and epsom salt can make the bars sweat ridiculously. You don’t want that. There are many beneficial minerals in sea salt, Himalayan salt, etc. Choose those instead. The salt in these bars make it set up fast. You need to have your essential oils or colorants ready and add them before adding the salt. After incorporating the salt really well, pour into your mold. If you have a divided mold (no cutting required) then your life will be a lot easier! I pour mine and wait 3-4 hours for it to harden, then remove from the mold. In my experience, you do not need to incubate it for 24 hours unless the salt content is 50% or lower. If you are using a slab mold (cutting required after curing) then the oven method may be your best bet. No, this is NOT hot processing. You will want to put your oven on its lowest setting (mine is 170 degrees F). After you pour your soap in the slab mold, put it in your oven and turn the oven off. This will keep it soft enough as it continues to process, allowing you to remove it and still be able to slice it. After 3 hours check to see if it is hard enough to cut. If so, remove it and slice it. Waiting 24 hours would make it very difficult to cut, probably making it crumble in your effort. I’ve written 6 Handmade Salt Soap Recipes for you to choose from and try. Make sure you click over to the recipes to learn more and get even more ideas. 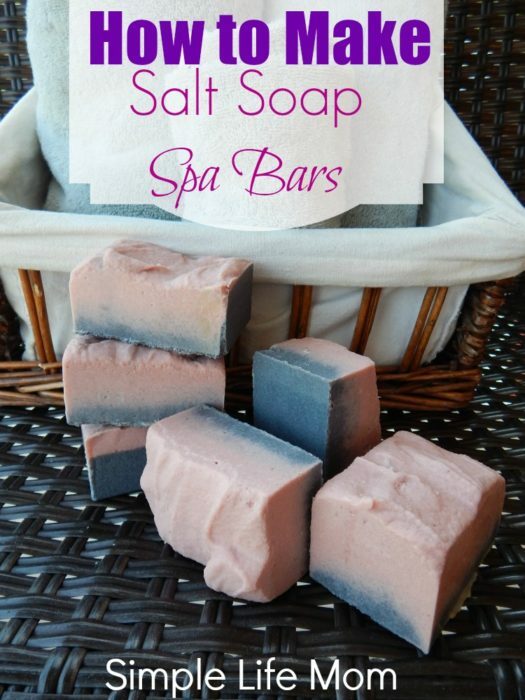 Have you made Salt bars before? What are your favorite percentages? Where does it say how much lye to use, or when you add it? I already have an article with 7 ready made salt soap recipes in the works (different percentages and different sized batches). I will finish it up and get it posted soon. I’ve never made salt soap before. These might be fun to make for Christmas gifts! I would defintiely recommend them as gifts. They are fun and different. This looks manageable and I’ve never made soap before, but always wanted to! Been toying with the idea of using Himalayan salts for salt scrub but I haven’t looked at it yet, to see what kind of texture it has (other than what’s in my salt grinder!). Is there a specific Himalayan salt you would recommend for your soap? I use pink Himalayan salt, but it is a lot in a batch so it doesn’t hurt to mix types. A good quality table salt will give a good scrub as well. nice post! I love making homemade soap! Thanks for sharing with us on the homesteader hop! I have wanted to try soap making for so long! I might just try this way!! Go for it Sarah! Its a lot of fun. By adding so much salt to the recipe, will it end up making more soap than you originally calculated (for ex. 31/2 lbs instead of 3 lbs)? Yes, count it as you would your oils when determining the volume of the final product. nice post! I love making homemade soap! can you let me know where i can buy raw items for making homemade soap ? You can buy some items at your local supermarket. Others can be found on amazon, starwest botanicals, or bulkapothecary, among other places online. Wonderful Mackenzie. I hope all goes well. Hi, are any of the salt recipes you shared suitable to use as shampoo bars? My hair has gotten very thin and I’m looking for something to volumize, as well as clean my hair. Thank you for sharing. I didn’t check to see how old or new is post is but I made some last night and with the exception of maybe leaving them in the single bar cavity molds and corners slightly breaking they came out perfect. I am going to make another batch with Hawaiian Sea Salt and remove a little sooner then over night and hopefully that helps. Any thoughts on why the corners crumbled a bit. That was just my assumption. I’m not sure what kind of mold you have, but yes, the longer it stays in the mold the harder it gets. Remove it around 4 hours or so before it gets too hard and it shouldn’t crumble. Can you add the colorant and fragrance to the salt first then to your mixture? Yes you could. It depends on what you’re using for coloring of course, but you could definitely do that. Hi! Newbie here. What kind of colorants are you using for the blue and pink in your bars pictured? I love how the colors seem to bleed. I’m using activated charcoal and rose clay. If you only add a little bit of charcoal, the combination with the cream soap and being paired next to the pink makes it look blue. What a joy to have found you! Lots of answers I am getting, interesting facts included. Am from Cape Town – Mother City of South Africa. 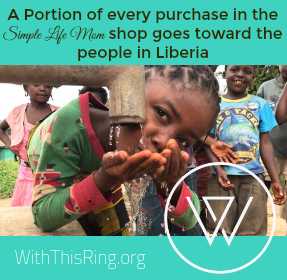 My interest in soap started last year, but due to working in Southern Africa, I could only start looking for answers again now – and I found many from you! And a good day I wish! I’ve made your Recipe for salt soap. Only after we cut ( I used pringles container) How long do wait for the bars to be cured? Hi Leslie, Salt soaps are like other soaps and need to cure for around 3 weeks. You want to make sure the lye has finished processing, but don’t need the extra cure time for hardness, since the salt soaps are naturally harder. Hi Kelly, can you advise the best size of grain to use for the salt? Would course salt be too grainy and scratch the skin? I use medium to fine grain. I’ve never used course grain. I do think it would be too scratchy on the skin. I was watching Home & Family this morning. They talked and made soap. So I looked it up on your site. It sounds like this would be a great thing to do if you need a hobby or start your own business. I am starting this today… thank you…Wish me luck.